It is cheap and necessary and sufficient. It is even better if you can purchase a housing that uses this terminal alone. This review is about item#32695966. This review is about item#32695975. Vehicle repair, wiring processing such as additives. When used for a general connector it is easy to remove and rework is necessary. I wanted to use it in the 2-harness harness, but it corresponds to the other 1.25 possible terminal. It might be a waste shopping with Choi as it fits snugly here? Since the picture of the product introduction is not in the back and front, it may get lost as it chooses with standards priority. Use of single item, product accuracy is satisfactory, COSPA is good so let's make no mistake in selection. This review is about item#34948304. Once inserted, it will never come out. The sent thing is different from the image, it can not be used with the coupler. No matter how thick it is properly attached, if you plug in the terminals together, the lock will be too tight and the terminals will not come out. If you pull it badly it will be hard for the lock of the terminal to get out of the thickened part. can not use. ◆ Circuit protector Applied to connection of limit switch. ★ After the mounting combined with the insulation tube for flat terminal of the company, The connection state is perfect. ◆ When changing the circuit, there is no big trouble, It is saved that it can be realized easily. ★ MonotaRO Multi-function electrical terminal with a tool for terminal The feeling of use is still slightly harder than Giboshi. Than I thought It is necessary to tightly caulk out firmly. If you stop as appropriate, a sense of stability without anxiety. I chose this and I can not afford it. We used this because sales of conventional products had been discontinued. Purchased for comparison with 250 standards such as Hitachi Auto Parts. Monotaro's thing was only 250 types and not 250 standards. It is ineligible for use in couplers. 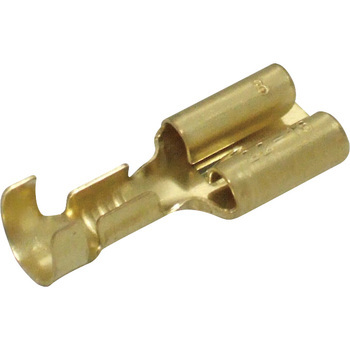 It is not suitable for repairing couplers such as difference in shape of lock stopper, slight size difference. It is only necessary to use them individually. It is very good that it is slightly rounded like crimping. Since it can not crimp properly when straight, it is necessary for one time but here it can crimp it cleanly even with a cheap crimping tool.